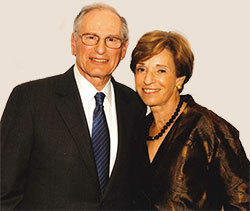 Sid and Ruth Lapidus are longtime supporters of the Omohundro Institute of Early American History and Culture. Mr. Lapidus has served as a member of the Omohundro Institute’s Board of Directors since 2008. Mr. Lapidus’s wide-ranging philanthropic interests include a strong commitment to historical research and scholarship. In addition to his membership on the Omohundro Institute’s Board of Directors, he is Chair of the American Antiquarian Society; recently made the founding gift for the Lapidus Center for the Historical Analysis of Trans-Atlantic Slavery at the New York Public Library’s Schomburg Center for Research in Black Culture; is Chair of the American Jewish Historical Society; and is a trustee and Chair of the Library Committee of the New York Historical Society. He is also a longtime member of the Advisory Council of the Department of History at Princeton University.